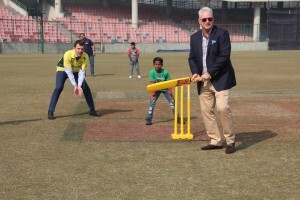 Dr Kiran and 25 young enthusiastic children from Asha were invited to take part in Victorian Premier’s Cricket Event on the 17th of January 2018. 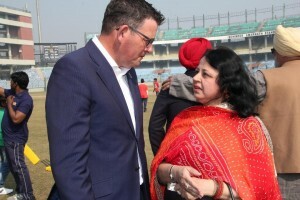 It was a star-studded affair with hon’ble guests presented were the Premier of Victoria The Hon Daniel Andrews MP, Deputy High Commissioner of Australia to India Mr Chris Elstoft, Special Adviser to the Premier of Victoria and State Member for Footscray The Hon Marsha Thomson MP, State Member for Dandenong Ms Gabrielle Williams MP, Victorian Government Trade and Investment’s (VGTI) Commissioner to South Asia for the State of Victoria Ms Michelle Wade, CEO of Cricket Victoria Mr. Tony Dodemaide, Former Australian Cricketer Mr. Dean Jones and Former Indian Cricketer Mr Bishen Singh Bedi among others. 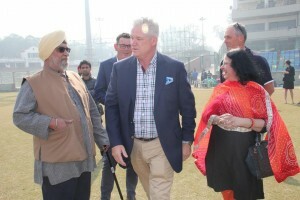 Former Cricket stars Bishen Singh Bedi, Dean Jones and Dr Kiran Martin exchange a smile.